Starting a magazine is not as hard as you would think. I have started several myself and successfully published them for years. Make no mistake, it is hard work, but if you can meet a few key requirements you can get your magazine off the ground. 2) Equipment – At least one good computer capable of operating the various software you will need (Adobe InDesign and at least Adobe Photoshop), a good digital SLR camera like the Nikon D50 which runs about $750, a phone and a dependable vehicle. 3) The ability to sell – Magazines big and small run off of advertisements and yours will be no different. I cannot stress enough how important it is to have a solid sales strategy in place before you take on this project. I will talk more about selling further along. 4) Creativity – You can’t survive without offering something new to your readers in an attractive package and for this being creative is a necessity. You probably have an idea of what type of magazine you want to publish but from here you need to construct some basic framework. Pick a name for your magazine carefully, make sure you are not stepping on anyone’s trademark by searching the US trademark database. Your website’s domain name is also something to consider when choosing your name. Search for open domains that match your magazine’s name as closely as possible. It is okay to use a few sudo-odd takes on domains for magazines like magazinenameonline.com or magazine-name.com. Register your domain and contact a web development company that you like to start work on your magazine’s new website. I personally like 22 Creative as they specialize in websites for magazines. Your website does not need to be awesome right out of the gate, just something professional that is clear about who you are and what your book is about – expect to spend anywhere from a few hundred dollars to thousands here. A website is an essential part of this process though, do not skip out on this one. Okay, you have a name and a website, what’s next? Figure out what you are going to include in your first issue by writing out an editorial outline. Fancy name but in reality, just write out what you want to feature, how many pages you want to devote to each item and how many pages for ads you want to stash away (this will be dependent on how many ads you sell for your first issue). How many pages should your magazine be? Two factors are in play here. One is the cost of printing the magazine as it costs more to print a bigger magazine obviously, the second is how much editorial can or do you want to produce? You do not need a 100 page book your first go around so, dependent on what your competitors are doing, aim for around 50 pages for a local or lifestyle magazine and 90+ for a magazine you want to distribute on national news stands. Contrary to popular belief, you do not need an army of ‘journalists’ to publish your first issue. I have produced content for hundreds of magazines by myself or with the help of just a handful of people, it is not that hard. Start with item number one on your editorial outline. Write your text first, making sure to follow basic guidelines for writing editorial (Google search it for tons of help). Have friends read the copy and get their honest opinion. Did you lose your readers attention at any point? Are your facts correct? Do you have any typos? A picture is worth a thousand words literally. People like pictures, big, colorful pictures and lots of them. Decide on how many pictures you need for the piece and whether or not you can take the photos yourself or if you need to buy them/license them from a stock photo service. If you can take them yourself, head out and start snapping. Take clear, in-focus images and take lots of them. You do not want to have to go back and re-shoot anything because you did not get the shot. Also, set your camera to take 300dpi images, normal smaller resolution images will not work and will look pixilated in the final product – nothing comes off as more rookie than low-res photos in magazines. Remember if you have any people in your photos, get them to sign a ‘model release’ allowing you to use their image in your publication. If you need to buy an image from a stock photo website, make sure you buy a 300dpi image that is suitable for printing. Expect to pay anywhere from $3 – $10 for each photo, if you encounter a website that charges more, you would be over paying. After you have knocked your editorial out, sleep on it and go over it yourself. Is it good? How many magazines have you seen that all regurgitate the same tired ‘electronics features’ of iPhones and some silly whatever that not many people care about? Lots. You have to have a new take on things if you want to see issue number 2, 3, 54, etc. New publishers often fall into the trap of just focusing on the creative side of the magazine and not the sales. As an independent publisher, you have to wear both hats. Start by putting together a media kit for your new magazine. A media kit is a couple pages, printed out that act as a resume for your magazine featuring all of the details of who your magazine is for, how many you print, your distribution tactics, what ads you offer and how much they cost, etc. In the beginning most of your sales will not be because of your media kit, this is just an essential thing to have to leave with prospective advertisers. I could go on and on about how to sell ads for new magazines but if you read it, you would have to send me a pretty big check as that is closely held information by all in the industry. What I can tell you is start with a plan; call on advertisers that make sense for your magazine. It is a waste of time to try and sell an ad to Budweiser if you are a new magazine that is about quilting – it’s just not going to happen. Put yourself in that business owners shoes, would you consider it? Now is not the time to get rich quick. You want to sell ads to pay the bills and hopefully recoup your investment and live. That means price your ad offerings in reality. For an idea of what reality is, try and find out what similar magazines in your market are charging. Do not go to low on your pricing however, believe in the value of your magazine – giving it away free almost guarantees future failure. I know of one magazine that just kept throwing money at itself, starting in new markets without first being profitable in one and to appear successful, they gave away their ad space. A couple years later and it is common knowledge in the media buying industry that no one pays for ads in that magazine ever. If a potential advertiser says they want it for less than you want to sell it for, pass on them politely and come back to them in a few months after you can prove a stronger value to justify your rate card. Most importantly, offer value to your advertisers. There are a gazillion different ways to do this but it all starts with you delivering a strong, readable publication on time. The old under-promise and over-deliver adage works well here. It’s crunch time. Layout is hardly ever pleasurable, my first issue I ever designed took me about 72 hours of work with about 6 hours of sleep in that period – not exactly what I call an awesome good time. Make sure you know how to use your software BEFORE you need to start laying out your pub. Pretty much the whole free world uses Adobe InDesign to layout their magazines. It is a reliable and easy to use program that will run you about $650 unless you can find a deal. You should seriously consider purchasing one of Adobe’s Creative Suites that bundles InDesign, Photoshop and Illustrator. Those three programs will take you anywhere you want to go in publishing as I have been relying on them for years. Yes that is some expensive software but is essential and well worth the money if you are serious about doing this right. If you flip through a random magazine here and there, you will notice that a lot of them have an inconsistent layout throughout the book, meaning that the fonts and styles change every few pages or every story. If this appeals to you knock yourself out, just know that it is not a good practice to follow. You need to aim for a balanced flow with your layouts. The first page of content should be very close to the last page and not stray too far in between. Use a text font at or above 8 points and never smaller. Don’t forget those pictures, lots and lots of pictures. Learn to use Photoshop to clean your photos up. I have spent at least 60 seconds with every photo I have ever placed in a magazine layout – it is a crime to run photos with zero post work done on them, just a straight up crime. I won’t go into an InDesign tutorial, plenty of people have done that better than I can before. What you need to ultimately do is end up with a PDF file for each page of your magazine that you will give to your printer. Name each file a standard p01_NAME.pdf. Covers will be labeled C1, C2, etc. You will have the option to view proofs of your files before your printer fires up the press to start your job (a big chunk of what you are paying them to do). Always look at every proof of every page; once it gets put on a plate and starts laying down ink, you are locked in. Make sure you are happy with your printer. If you do not have a printer to print your job, start by talking to Las Vegas Printing to get a quote on your job. I recommend getting your finished magazines carton packed rather than skid packed and wrapped in plastic as this practice guarantees a percentage of waste due to not protecting the magazines on the outside of the skid. 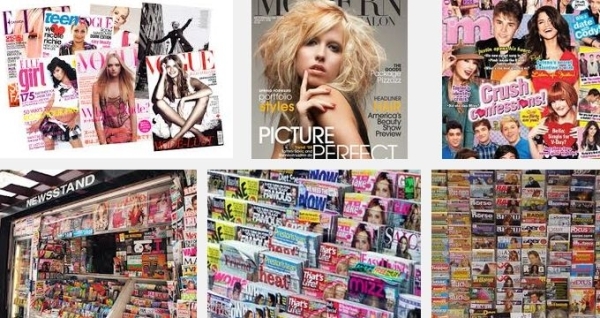 If you are starting a magazine that will have National or a large ranging distribution, head straight to one of the two major magazine distributors. I won’t name them because they, in my opinion, make it very difficult for start ups to get in the game. I will leave it at that. If you are starting a locally distributed magazine, read on. Yes there are services that offer to distribute your magazine for you, they will do a poor job and charge you and arm and a leg for the privilege. Distribution is paramount. If no one sees, picks up or reads your magazine then it is just a waste of time, money and trees. A major part of your focus should be dialing in the best distribution strategy possible. Do not just toss magazines in front of stores, bars, etc. and expect them to take the time to place them out in a neat fashion – they will end up in the dumpster out back. Do your own distribution. Personally ask permission from each distribution spot, not only is this the right thing to do but it is a great way to get your name out there and meet a few potential advertisers. The process never stops in the magazine game, it is a fight at all times. There will always be strong competition, new people looking for their share of a market and times where you feel like you are the only person that reads your magazine. But if you do not fight at all, it’s a guarantee that you will not win. Good luck! Rachael is a freelance writer and consultant for Las Vegas Printing a printer based out of Nevada specializing in magazine printing.